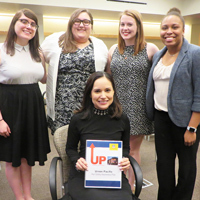 For the 15th year, Webster University seniors designed real-world campaigns as part of the capstone public relations campaigns class in the School of Communications. The experiential-based class provides students with experience working for real clients to solve communications issues. The students designed a railroad crossing safety campaign for Union Pacific, helped Nestle Purina Petcare build relationships in a small Georgia community, and aided a nonprofit preschool, The Learning Center, in Sunset Hills. 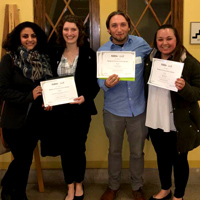 Five staff members of The Journal, Webster University's student newspaper, won Mark of Excellence Awards at the Region 7 Conference of the Society of Professional Journalists (SPJ). The students won first-place awards in general news reporting, in-depth reporting, and featuring writing, while one was also a finalist for a second article in the feature writing category. 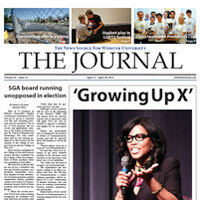 Their award-winning work covered current issues in St. Louis and campus life events. 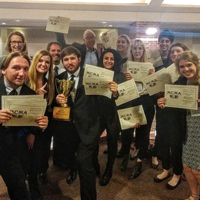 The Journal, Webster University’s student newspaper, won 28 awards at the 2017-18 Missouri College Media Association conference, including Best in State and several individual awards for news and sports writing, news reporting, photography, video, multimedia, cartooning, design and more. The newspaper received Best Overall Newspaper (all divisions) as well as 1st Place Sweepstakes (Division 2), for the most points accumulated based on the number and rank of awards won. 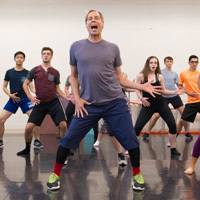 Lara Teeter taught at Kristin Chenoweth’s Broadway Bootcamp in Oklahoma. ... Kim McGrath and Ron Daniel presented at NAFSA in Los Angeles on "Global Citizenship: Learning Outcomes in a Worldwide Curriculum." ... Rick Rockwell was cited for his webinar work with journalists in Afghanistan and the Salam Watandar radio network by Internews. 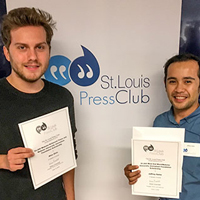 The Journal, Webster University's student newspaper, won 26 awards at the Missouri College Media Association’s (MCMA) annual conference held at Southeast Missouri State University in Cape Girardeau. Webster's paper claimed both a first-place sweepstakes award in its division of state college newspapers as well as a second-place award as the best overall student newspaper in the state. 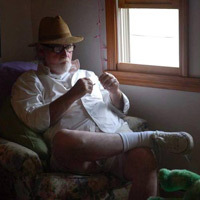 Professor Don Corrigan is the print adviser, and assistant professor Mary Cox is the adviser for web journalism and social media.